Is this. 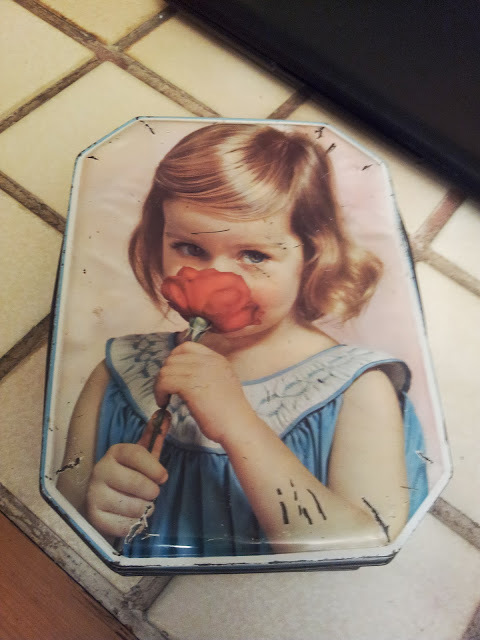 Its a toffee tin, I think, (it says from the makers of Cremona and Red Boy Toffee on the side). It must have been made in the forties or fifties I think. Possibly the thirties, but I'm not really sure. I inherited it when I was 10 from my great grandmother, along with all her collection of embroidery threads. I still have some of them. She was ninety eight when she died and Parkinsons had meant she hadn't embroidered in years. The threads I still have are probably pushing ninety themselves now. It was those threads and that tin that sealed my love of embroidery. Its been my project tin - where I keep the relevant threads, needles etc for which ever project is on the go. I normally am disciplined enough to have just the one embroidery project going. Its gone to America, all round Britain and Europe, to university, and work. Its getting battered now, as its been on the go for probably sixty years. It will fit in my handbag if it needs to, and is small and light enough to be practical, whilst still having enough room for plenty of thread bobbins. Sure there are slicker, more whizzy sewing baskets and organisers out there, but this one doesn't just do the job, it has sentimental value. Its been on every sewing journey with me, and for all my love of toys and gadgets, this is one item I couldn't possibly upgrade. With any luck I'll leave it to my great-granddaughter some day.